This post will be all about Outlander, minus most of the Sam stuff, because he’s got his own “All About Sam” post already. This one will be more of an overall impression and about my own experience than a detailed recap from the panels, because participating – waiting at the microphone, trying to stay calm, asking the question – seems to have taken up most of my mental capacity, so I don’t really remember all that many stories or answers from the panels. Sorry. I’ve been a huge fan of the Outlander series (and everything from the Outlander universe) since I started reading the first one in 2009. I’ve been following Diana on social media and via her website and really enjoyed reading/seeing most of her interviews. So I was thrilled to find out that Diana would be present as well, as she is the one who started all of this, after all. I had planned to get my 20th anniversary edition signed and to attend both of her panels/readings, but unfortunately that didn’t all work out as planned. The times for her signing and for her reading often mashed with other events (photo with Duncan / autograph signing with Sam and Gary) or with the few moments when I felt like I had time to grab a coffee or a bite to eat. I admit on that weekend the guys (and all the coffee *g*) were a bit of a priority. Sorry, Diana! I caught the first part of her reading / panel on Saturday, but didn’t stay till the end. Partly, because I already had heard / read most of what she was talking about, like how she got into writing and such. But also partly because by now I’m so used to hearing “British English”, that an American speaking as rapidly as Diana often does, makes it diffcult to keep up at times. I know that’s rich coming from me, who tends to speak rather rapidly as well and I was surprised myself, that trying to keep up with Diana’s tales made my head spin after a while. Maybe I also was already too nervous about what would happen with Sam at the panel later on? During the Outlander panels Diana was lovely and witty and told a lot of interesting stories. I just wish I could recall one in particular :-( She obviously enjoyed chatting to Liam McIntyre during the Opening and Closing Cermonies and it’s too bad I didn’t manage to snap a good photo of that. It was kind of cute. In all fairness Liam, was a total flirt with everyone all weekend, so…. 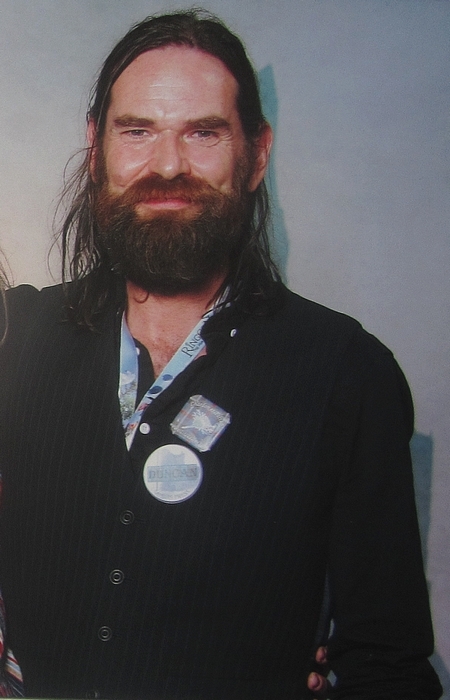 He was the reason I attended HobbitCon in April 2014, while they were still shooting the first season of Outlander and it hadn’t premiered yet. I had my photo taken with him and even mananged to ask him a question during the panel and wrote a long post about it back then. I hadn’t planned to get another photo or autograph this time, but while I was in the long line for Sam’s autograph singing, I did watch Graham in the room as well, and he was just as friendly and lovely with everyone as I remembered him to be. Great guy! He was wearing a kilt during the first Outlander panel on Saturday afternoon and he was looking goooood! He also was a very good sport about Sam and Duncan doing impressions of him, gruffily ordering more coffee and such. And he told a funny story how while Sam was out climbing mountains in all kinds of weather, Duncan and he spent a relaxing weekend in a spa/wellness hotel in Perthshire (?). I don’t remember who asked the question, but there was a moment where he was talking about his beard – which is impressive by now, by the way. He said something funny like hiding the fact that he doesn’t have chin and that no one really knows what his face looks like underneath. There was another question like what did they all learn from their characters or what do they use from their characters in real life. Duncan replied that he sometimes catches himself putting on the really gruffy, mean look and involuntarily scares people by it. And then joked, that maybe he should start using that look as his advantage. how the Gaelic lessons did go for him? what HE really thinks about wearing a kilt to work? and if the other guys either by chance or on purpose ever made him feel like a “Sassenach”? I hadn’t been sure if I would want to spend money (and time!) on photo / autograph of anyone but Sam. But I did a photo op with Duncan on Saturday evening, because I do like his Murtagh and because he answered my question so nicely. There was another great Duncan moment for me personally in the 2nd Outlander Panel on Sunday, when they were all asked about what travel reccomendation they had for Scotland. Gary mentioned the Outer Hebrides and Duncan agreed and said, he had heard that people from Thailand took pictures from the beaches up there and used the footage as “Thai beaches”. My reaction to that was: “Yeah, I can totally see that happening”, because I’ve been there this summer and the beaches really are magnficent. I would have been the 2nd person in line to ask a question, when the time run out and I was bit bummed out, because I really, really, would have loved to publically supported what Duncan had said about the beaches on Lewis/Harris. Oh my God! What a lovely, sweet, great man! It was his first convention as well and even though he might not have known what to expect, I think he embraced the experience whole-heartedly. He was so genuinely touched by so many fans showing up and telling them how much they like the show and their work and everything. He was a complete darling all weekend! He was also very outspoken about his politics, supporting an Independent Scotland and he explained why. Not because of any Anti-English-ness, but because he thinks the next generation in Scotland deserves to make more of their own decisions about their future and not be ruled by far away London. I might not agree with everything of his politics, because I frankly don’t know enough about Scottish/English relations, but I admire that he took a stand so publically. My friends who had been allowed into the autograph session on Saturday already, told me that Gary had been a sweetheart with everyone, so Sunday morning I decided to go his table as well. And what can I say, he really was. He took his time chatting with everyone even though the staff member at his side cautiously reminded him to “work” a bit quicker and to keep the line moving. He said, he would. But then he never did ;-) After singing and chatting a bit he always got up and gave the fan a hug. He was such a sweetheart. He even started to sing “Auld Long Syne” with a group of fans, which was met with a round of applause and cheers from the whole room. I had brought my TV edition of the Outlander novel for him to sign and asked him about filming “Tide” (short movie) on Lewis/Harris some time ago. I had made sure I had my facts right, before I went into the room, I admit it, even though I very clearly remember some crowdfunding going on for that movie, while he started shooting Outlander. I mentioned to him, that I had been on vacation on Lewis/Harris this summer and he so enthusiastically started chatting away about this beautiful island and asked me if I had been to the Stones of Callanish and all. Which, of course I had been. We both gushed about the landscapes and the beaches and then I mentioned that I went to Luskentyre and he got even more excited, which was soooo adorable. But, let’s face it, the beaches at Luskentyre and everywhere on that island are amazing. I like to believe I got an extra big hug and kisses for that :-) He really was such a sweetheart. When he replied to the forementioned question about travel reccomendations for Scotland during the last panel he said “Outer Hebrides” at once and told the audience how he had just chatted about it this morning with a fan and he mentioned Callanish and Luskentyre. I was in microphone queue and thought “Oh, that was me!” and I might have even raised my arm and waved (bit pathetic, maybe? I don’t know. It just came over me…) I really would have liked to get the chance to support that travel reccomendation publically once more. But… it wasn’t supposed to be. Gary seemed to have really enjoyed the weekend and he was such a genuinely nice and interesting guy. I wish I could have spent a bit more time chatting with him, I think he’d be a great guy to talk about Scotland and politics and the movie and theatre business, because he has done so much great work already. I really hope to see him again on any other Outlander panel at any convention. He’s a great guy!